The University of Alabama enrolled 37,665 students in fall 2016. 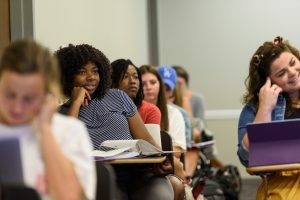 TUSCALOOSA, Ala. — The University of Alabama continues to attract the state’s and nation’s highest achieving students as it marks another year of record enrollment. This year’s freshman class represents the most academically talented in the school’s 185-year history. More than 40 percent of UA’s 7,559-member freshman class scored 30 or higher on the ACT, up from last year’s record 36 percent. In all, UA enrolled 37,665 students this fall, up from 37,100 in fall 2015. More than 31 percent of the freshman class had a high school Grade Point Average of 4.0 or higher, up from 29.5 percent last year. The class’s average ACT score is 27.1, the highest ever for UA, and up from last year’s 26.6 average. “Our students and their parents express, through their college selection, confidence in our abilities to help them achieve their goals, both as students and as they plan for life after college,” Bell said. The freshman class includes 151 National Merit Scholars, and 2,536 freshmen are enrolled in Honors College, a more than 12 percent increase over 2015. UA’s freshman class is 4.8 percent larger than last year’s class.